On stormy days when it’s cool out, I have this overwhelming urge to go home, cuddle up with my book, and sip hot cocoa. Never mind that tropical rainstorms usually come and go quickly, and by the time I drive home from work, it’s usually over and back to 95 and sunny. 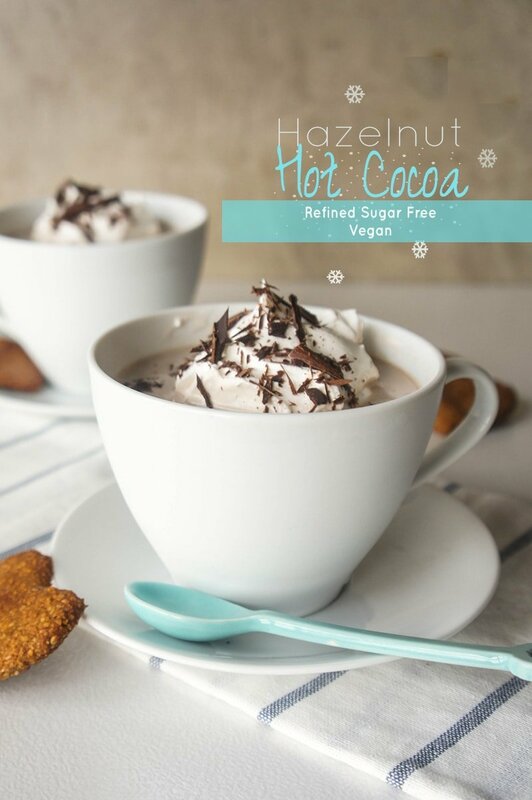 Luckily, this vegan hazelnut hot cocoa is great enjoyed hot or iced. It’s been one of those weeks where things keep going wrong, and life’s quick pace just won’t slow down to let me catch my breath! Last weekend, on the way to a conference I was attending for work, I was pulled over. It’s common in Kuala Lumpur for the police to just set up barricades, and check your registration sticker as you drive by. I paid my car insurance and registration just a few months ago, so was confused when I was waved over. The “ticket” the officer had begun to write was actually just a blank piece of white paper. Having me pay the ticket “right here” was exactly what he was getting at by exaggeratedly explaining to me the costly ticket he was going to have to write (expensive in Kuala Lumpur is a $100 ticket). So, $50 out the window, and I was on my way. With my friend driving the rest of the day. On Monday, I called the insurance company that I had paid back in August to find out why they had never sent new stickers, and found out that although I had paid, and had proof of a bank transfer, they had never processed the payment, and I actually have been driving amidst wreckless Malaysian drivers, uninsured, for the past several months. Insurance company fired. New company found. Trying to get these issues resolved, I got the name of an agent some of my coworkers use for car insurance and paying tickets. I arranged for a personal day from work to go to the embassy and get the necessary paperwork for a Malaysian driver’s license. And then, realized that my passport and car title were in our safe, and Alex was out of the country with the key. 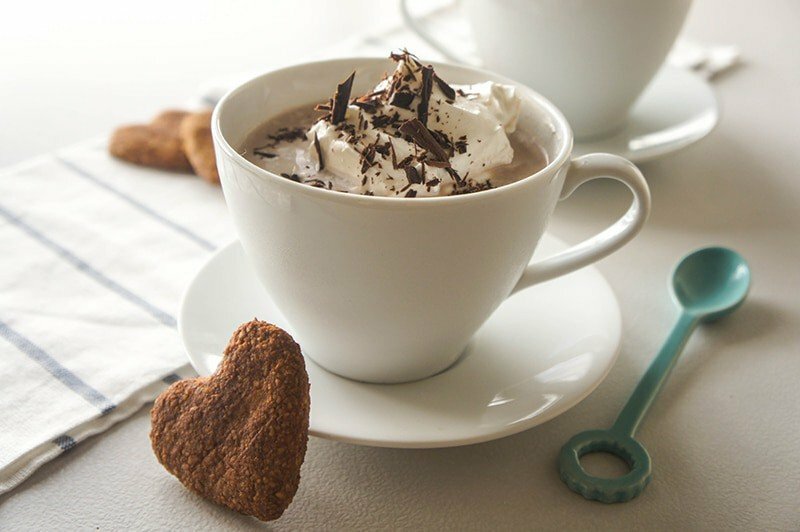 I finally got everything resolved this morning– but not wanting to drive until the agent delivered the new paperwork this morning, I put off my usually Saturday morning errands and stayed home– to make hot cocoa. A new favorite recipe. Once you try this, you’ll never be able to buy a packaged mix again. Yes, it takes a bit longer– but really, it’s very fast to blend and strain the nut milk. 100% worth it for this healthy, vegan, no sugar added treat. I’m normally a very dark chocolate person. Forget the milk, just pass the cocoa beans, please. The creamy, rich hazelnut milk was begging for this to be a milk chocolate drink. I wanted the hazelnut flavor to really shine, so I used restraint when adding the cocoa powder. I also used raw cocoa powder, which is lighter to begin with. Perfection. Enjoy! 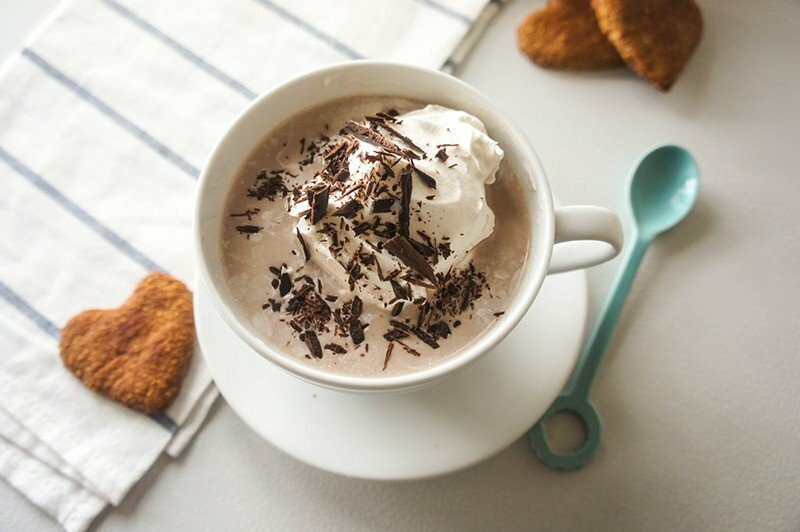 A milk chocolate hot cocoa, made with homemade hazelnut milk and sweetened with dates. 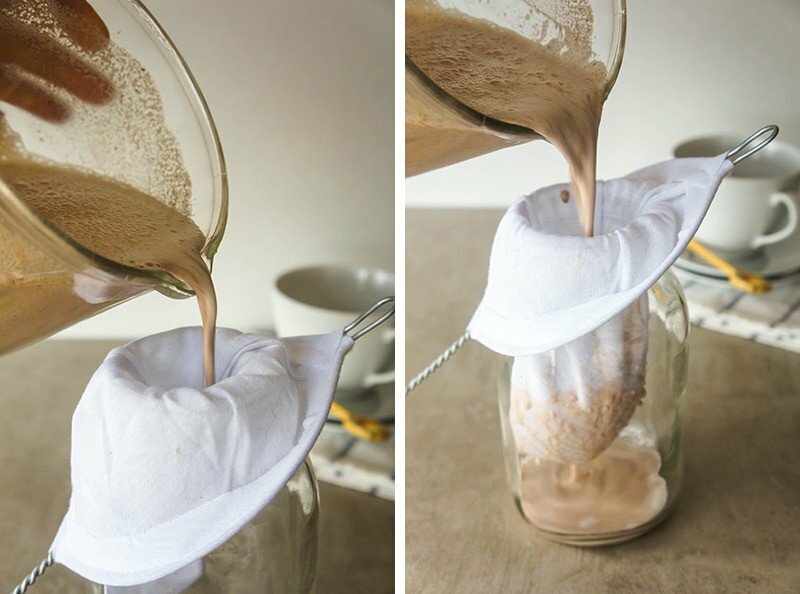 Feel free to substitute store bought hazelnut milk to save time! 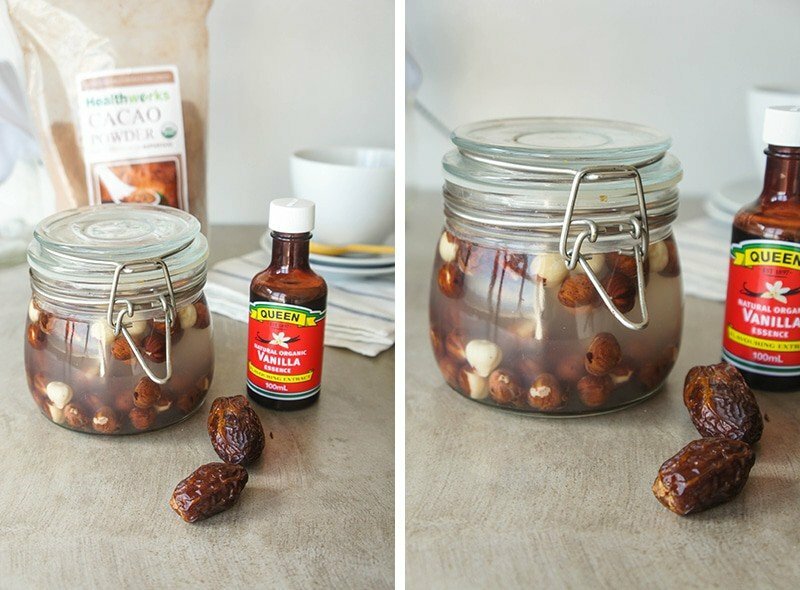 Soak hazelnuts in water overnight, or in the refrigerator for up to 5 days. Prior to making the hot cocoa, soak dates in hot water for about a minute to soften. This isn't necessary if you're using fresh, soft dates, or have a high speed blender. Rinse and drain the hazelnuts. Add the nuts to a blender with ⅔ cup water. Process until the nuts have formed a paste, about 2-3 minutes. Add the dates, cocoa powder, vanilla, almond extract, and sea salt. Slowly add the rest of the water, processing, until all the ingredients are mixed well (about 1-2 minutes more). Strain the mixture through cheesecloth. It helps to use a spoon to stir up the pulp that settles. When most of the liquid has drained through, squeeze the pulp and try to extract as much liquid as possible. Gently heat up the hazelnut milk, or enjoy cold. Garnish with coconut whipped cream, if desired! Thanks Jennifer! It is delicious-- having my last cup of this weekend's batch with breakfast this morning. This looks so warming, comforting and yummy! You totally needed this hot cocoa ;) I know I would have! Thanks Meredith! I'm dreaming of coming home to winter! Missing it right now. Dealing with bureaucracy outside your home country is always challenging. It really makes you appreciate the efficiency of the States- even if while you're living in the States, you don't feel like it's all that efficient-- all relative! Awesome recipe! Can't wait to curl up and try it out! Thanks for linking up to Snickerdoodle Sunday! 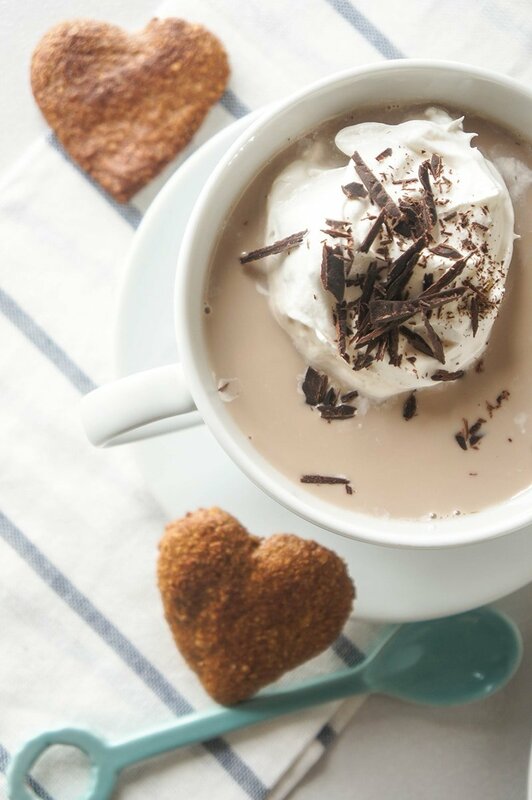 It's a pretty special hot cocoa recipe. Excited to be in the snow with my family in December-- and will make a big batch of this for everyone on Christmas Eve. 1. This looks so yummy! With the insanity (read: snow) going on outside, I wish I had hazelnuts to make a cup right now. 2. I feel you about days that just can't go right. I had way too many of those last week. Glad everything finally worked out though :D Pinned! Love your recipe and your photos are beautiful.I found you from Pinworthy Link Party. Thank you Celeste! This is a favorite recipe-- one I will make for years to come! I can't wait to make it for my family this Christmas. It is pretty amazing! I hope you try it! This looks amazing!! Pinning! Thanks for sharing it with us at Foodie Fridays...I love seeing what you share with us! Your pictures are gorgeous! Thanks Michelle! I love hearing that. I've worked hard learning the ins and outs of food photography this year, and am happy with how far I've come! That looks tasty. I love your spoon! I'm stopping by from SITS & I hope your having a great day. I love that spoon too! My mom actually sent me a box of old kitchen stuff when I started my blog, and that was in there. Something she had stored away in a box for years and had never used! Treasure.